FBC West is a Christ-centered and biblically-based family of disciples sharing the hope of salvation in our community. Every member is a minister at this church and we are committed to serving the Lord in our homes, our community, and around the world. We have a variety of ministries and service opportunities that provides a place for everyone in your family to participate and serve. We strive to glorify God because He is worthy of our praise and our service, and because we are eternally grateful to Him for including us in His family. 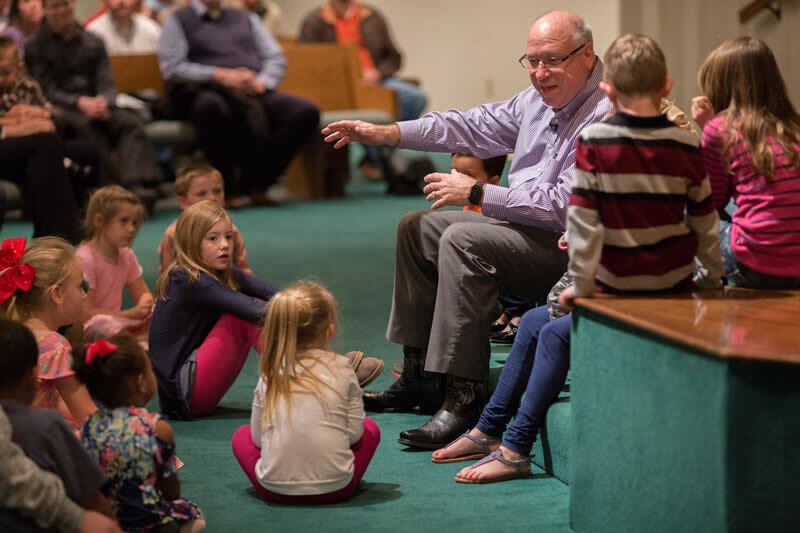 As an integral part of the community, FBC West provides opportunities for spiritual growth, personal ministry, and fellowship, while touching people of all ages with the love of Christ. These are the guidelines that direct everything we do at FBC West. Worship is about what we do for God, not what the church does for us. The local church should have a positive impact on its community. We do church best when we do it in small groups. We focus on church health instead of church growth. FBC West subscribes to the Baptist Faith and Message of 1963. Read the full statement of beliefs. The Holy Bible was written by men divinely inspired and is God's revelation of Himself to man. It is a perfect treasure of divine instruction. It has God for its author, salvation for its end, and truth, for its matter. God as Father reigns with providential care over His universe, His creatures, and the flow of the stream of human history according to the purposes of His grace. God is Father in truth to those who become His children through faith in Jesus Christ. Christ is the eternal Son of God. In His incarnation as Jesus, He was conceived of the Holy Spirit and born of the virgin Mary. He honored the divine law by His personal obedience, and in His death on the cross, He made provision for the redemption of men from sin. A New Testament church of the Lord Jesus Christ is a local body of baptized believers who are associated by covenant in the faith and fellowship of the gospel, and seeking to extend the gospel to the ends of the earth. This church is an autonomous body. The New Testament speaks also of the church as the body of Christ, which includes all of the redeemed of all the ages. Christ's people should organize such associations and conventions as may best secure cooperation for the great objectives of the Kingdom of God. Such organizations have no authority over one another or over the churches. First Baptist Church of West was organized in 1858 as the Bold Springs Baptist Church. The first place of worship, a tiny frame building with none of our present conveniences, was built on a farm about one mile south of West. Grass was plentiful and cattle were roaming at will on the rich fertile soil that promised an abundance of good crops to the settlers who began to arrive in Central Texas in large numbers. At a time when there were only four other Baptist Churches in McLennan County, FBC West served the local community of West and participated in all aspects of town life and leadership. With the love of the Lord in their hearts and a willingness to work, these pioneers laid the foundation for the congregation in which we now worship. These roots are a heritage that we extend when we join as a church body and live out what we believe in a bold way. West is about 17 miles north of Waco on I-35. The primary exit for West is Exit 353. When you take exit 353, drive east into town on FM 2114, also known as Oak Street. Drive three blocks, turn left onto N. Marable. Our church is three blocks on the left; the address is 501 N. Marable.